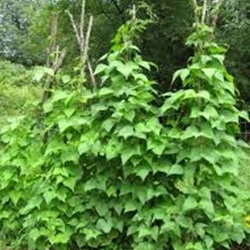 Beans are tender annuals that prefer full sun, average fertility and well drained soils. Pole beans prefer to be trellised. Available in a four pack. All plants are certified organic. Select here for transplant information, pick up and order dates. Stringless bright green pods on plants that grow over 8 feet tall. This famous variety has been a favorite for many years. Dark green pods are 5-6 inches long.